One of the best features of Gillette Stadium is not only Patriot Place, but rather the alternative method of travel available to and from Patriots games. It is not required that fans must spend an hour-plus wait in traffic before and after football games. Fans have the opportunity to take commuter rail to and from Boston and Providence, and stops in between. This is an excellent benefit for both fans and the franchise, which has been burdened with attempting to ease the traffic congestion around the 68,756 seat stadium. The partnership with commuter rail owner Massachusetts Bay Transportation Authority (MBTA) and its operator Massachusetts Bay Commuter Railroad, has proven to be popular. For the beginning of the 2011 Patriots season, MBTA added additional rail cars to its “Football Train” service. This service to Foxboro for Patriots games provides an excellent glimpse of the benefit commuter rail could have for the Patriots if full-time service were added. Studies have already been conducted, and there have been opinions for and against the proposed new route. Everything from funding, to profitability, to environmental impact has been studied and debated. There has been a trend in recent years among sports and entertainment venues and incorporating public transportation. Gone are the days when stadiums are built with the expectation that 100% of the fans will be arriving by car. The combination of better transportation options, traffic congestion, and high gas prices has provoked a surge in the use of public transportation to sporting events and concerts. Many of the new arenas and stadiums being built include plans for high volume use of public transportation. Connecting Patriot Place and Gillette Stadium to Boston’s South Station and possibly Providence full-time would be a great benefit for not just Patriot Place, but Foxboro as well. As more people come into Foxboro every day and shop at Patriot Place, or dine at restaurants, the local economy will continue to grow. For any great venue, accessibility is substantially important. 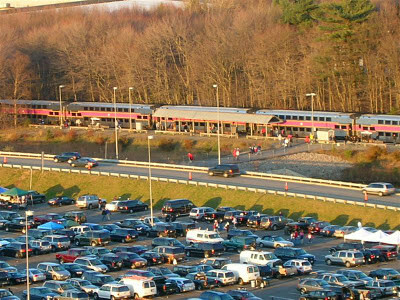 Full-time commuter rail to Foxboro would make it possible for a growing lifestyle and entertainment center to further connect to Boston, and bring in more tax revenue for Foxboro. With the increased number of commuter rail trains, the congestion in and around US-1 and I-95 would decrease, improving the traffic flow in the area. This would not only be an improvement to the local economy, but an improvement to infrastructure as well. Patriot Place’s location can be both its best asset and biggest challenge. It is time to solve this problem, and bring full-time commuter rail to Foxboro. Well, the rest of the world has this type of spectator travel well in place. Here in Brisbane AUS, where we have 2 major stadiums, the cost of the game ticket includes free public transport. Of course, it is not "free" as such, the cost being built into the price of the ticket, but it enhances the fan's event experience as it is 2 occasions that he is not required to put his hand in his pocket. It also helps that each of these stadiums is within 5km of downtown.